The Headline(s): Martin Truex Jr. weathered two strong challenges in the closing 25 laps of Saturday’s Toyota Owners 400 at Richmond Raceway, holding off both Clint Bowyer and Joey Logano to score his first career Cup win on a short track, first Cup win of 2019, 20th career Cup win, and his 33rd career NASCAR national series win. Logano, Bowyer, pole-sitter Kevin Harvick and Denny Hamlin rounded out the top five. How It Happened: Though Harvick took off after winning the pole on Friday afternoon, Stewart-Haas Racing’s run at the front only lasted 30 laps before Kyle Busch took the lead. Winning the race off pit road, Busch held the point through the rest of stage one, though Logano was visibly catching Busch in the closing laps. That long run strength in the No. 22 car showed up once again. After winning the race off pit road, Busch held the lead until pit stops under a lap 128 yellow flag for Kyle Larson cutting a tire and pounding the Turn 1 wall. 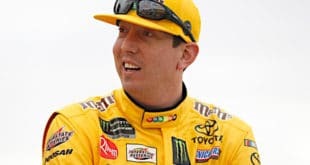 Busch yet again won the race off pit road, though, he ceded the top spot to Truex after being busted for speeding on pit road. Truex led until lap 195, but while visibly loose, Logano got past the Joe Gibbs Racing Toyota and stole the stage two win. Logano held the lead off pit road heading into the final stage and kept the point until a lap 243 caution for Michael McDowell’s wreck after a blown right rear tire. Truex beat Logano off pit road on the ensuing cycle of pit stops, and stayed out front until lap 265, where Brad Keselowski used the outside line to get around Truex for the race lead. Keselowski’s run out front was short-lived, as Truex retook the lead on lap 294 as Keselowski’s Ford was showing visible issues with brake heat that tightened the No. 2 car up. Truex would lead the rest of the way, sans laps 319 to 321 as the field cycled through green-flag pit stops, though it got intense in the closing laps. Bowyer got up alongside Truex’s Toyota inside of 25 laps to go, though, Bowyer faded in the closing laps as the No. 14 appeared to burn up its tires in catching Truex. That opened the door for Logano, who got to Truex’s bumper coming to the white flag. Attempting to use the high line to make the pass for the win, Truex was able to make his Toyota just wide enough through Turns 3 and 4 to prevent Logano from making the pass. Should You Care? 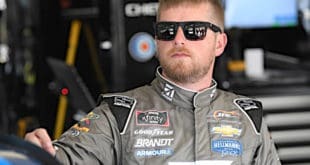 Unfortunately, Saturday night’s race at Richmond proved largely underwhelming, providing nowhere near the action that fans enjoyed at Bristol Motor Speedway last week, despite a closing 25 laps that were well worth watching. The issues were more of the same that have plagued NASCAR racing all season long; the new packages have not fixed the inherent aero issues that continue to plague racecars with front air dams, FOX’s television broadcasts continue to show only a sliver of the field, and the same two teams keep winning everything (Joe Gibbs Racing and Team Penske are now nine-for-nine in Cup races this season). While essentially a replica of the party decks seen in minor league baseball all over the country (and, as Twitter pointed out, that the vast majority of NASCAR tracks have always offered free parking), the results were visible. With a $20 ticket for a decent seat at a short track, the Chaos Corner section of the track sold out. Though this section certainly benefited from being lower density seating in selling out, it was the only section of the Richmond Raceway to sell out. This column said it at Bristol and will say it again: cut prices and get butts in the seats. The second observation: while seeing local short tracks hosting midweek races in conjunction with upcoming Cup race weekends is nothing new (DIRTcar Nationals in Florida, the K&N West dirt race at Las Vegas), this weekend’s promotion between Richmond Raceway and the Virginia Motor Speedway was the first I can remember where a Cup track teamed up with an off-site facility to offer a ticket package. Virginia race fans could buy a three-day package that included Xfinity and Cup tickets at Richmond, plus a ticket to the Thursday Night Thunder sprint car feature at VMS. This type of promotion deserves some recognition, though it doesn’t come without risk. VMS’ two-division program took more than five hours to run between the start of hot laps and the end of the first feature of the evening, and while some of that was attributed to a power delay out of the track’s control, the event was not a shining example of a fast-moving short track program. 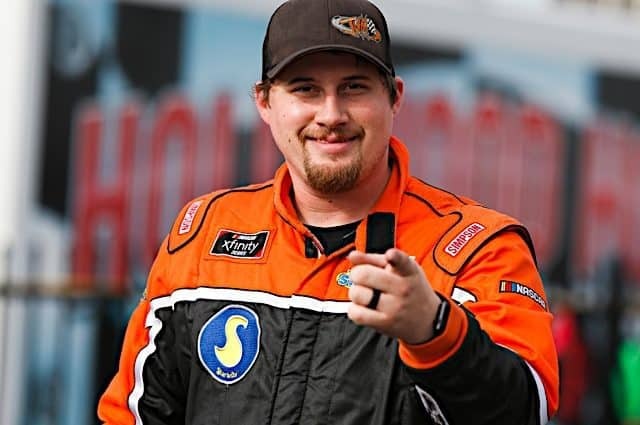 A five-hour event on a weeknight is a tall order for local fans that have to work the next morning, and not the best sales pitch for big league NASCAR fans not accustomed to bullring racing. As mentioned previously in this column, connecting back to the grassroots facilities across the country is, in theory, desirable, but in practice something that will take time and honest appraisal of what the facilities can and can’t do. Richmond was far from racing perfection this weekend. But in true short track form, the facility is making unique attempts in race promotion that demonstrate effort. Effort doesn’t guarantee results, but the effort should be recognized nonetheless. Truex’s race-winning performance was notable; despite having a Toyota that was visibly experiencing handling issues in the closing laps, Truex was able to hold off Bowyer long enough for Bowyer’s tires to overheat, and then able to make his Toyota just wide enough for Logano to be unable to make a pass for the win on the final lap. As much as the FOX booth was beating a dead horse in stressing his 0-for-80 streak of short track races at the Cup level, Truex being able to finally seal the deal at Richmond after failing to win despite leading the most laps in four of the last six Cup races at the track (the same track that Truex audibly fired his entire pit crew in 2011 when a bad stop cost him the win in Michael Waltrip Racing’s No. 56) was an accomplishment. That’s a new frontier for the Truex/Pearn duo to conquer, and they’ve now broken through at Joe Gibbs Racing. Welcome the No. 19 team to the title contender conversation. Though they still haven’t broken into the win column this season, Stewart-Haas Racing had a very strong performance at Richmond. Both Bowyer and Harvick scored top-five finishes and were fixtures in said top five for the entirety of Saturday’s race. And while Aric Almirola and Daniel Suarez were relegated to finishes of 18th and 23rd after experiencing pit road speeding penalties in the final stage, both the Nos. 10 and 41 cars sliced and diced through the field in Saturday’s race. 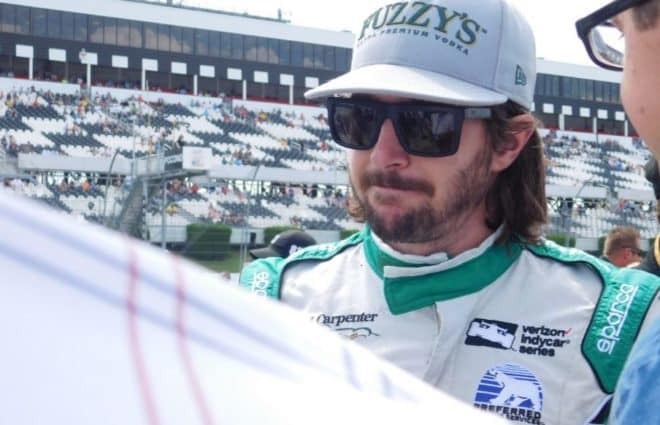 Both drivers were forced to start outside the top 30 after failing post-qualifying inspection, both passed more than 20 cars in the first stage, and both drivers spent time in the top 10 prior to their speeding penalties. SHR is a sleeping giant in the playoff conversation. Austin Dillon‘s sixth-place finish was his best of 2019, and easily the most consistent performance the No. 3 team has had on any track this season. Ryan Newman and Paul Menard both scored top 10 finishes; the other Fords have scored consecutive top 10 finishes after failing to score top 10s in the first seven events of 2019. Logano’s reliance on and apparent frustration with his teammates in accomplishing some of what he did Saturday night is reason for pause in the Penske Racing camp. For one, though Logano was stronger than the JGR Toyotas of Busch and Truex in the closing laps of stages one and two, Logano’s pass of Truex to win stage 2 was aided by Ryan Blaney running interference as a lapped car. 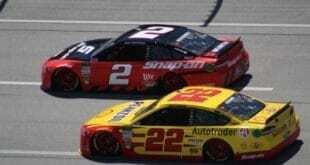 More notable though, Logano was heard raging over the team radio around lap 318 as he battled teammate Keselowski for position, ultimately unable to pass the No. 2 car before making a green flag pit stop. Given that the entire race went green from that pit stop to the finish, one could argue that hard racing between Logano and Keselowski cost the No. 22 car a shot at the win, much as the two teammates got into a pitched battle at Fontana that ended with Kyle Busch running away to victory there. But on the other hand, a) no one wants to watch team orders and b) Logano needs to get over this seeming reliance on his fellow Fords to make things easier. This is, after all, the same Logano that vocally went after McDowell for not aiding him with drafting in the closing laps of the Daytona 500 back in February. Speaking of Blaney, Richmond may be a weaker track for him, but running 25th, two laps down, on a night that Logano and Keselowski both were top 10 contenders that combined to lead 83 laps is not acceptable. Especially given that Richmond is a playoff track. Larson suffered another wreck after contact with Daniel Hemric cut down his left rear tire. The damage was significant to the No. 42 car, but it’s notable that Larson went straight behind the wall after the wreck, ending any chance his team had of fixing the car before they actually inspected the damage. Over the last three races, Larson’s average finish is 31.6 with two crash-related DNFs, and he now sits outside the playoff cut line. That Buescher finished 22nd was disappointing. That FOX failed to elaborate in any way shape or form as to what happened to drop the No. 37 from the top 10 over the course of the last 200 laps was more than disappointing. It was a pure, abject failure. If such obstruction can be accomplished on the track during green flag conditions, especially by a lapped car in Blaney that still has everything to race for in 2019 (they haven’t won a race), imagine when we come back to Richmond in September, where more than 20 cars in the field will be outside the playoffs and have significantly less to race for. It’s not hard to imagine tires or cash exchanging hands for backmarker cars to run interference on the track…after all, it wasn’t that long ago that Bowyer’s “itchy arm” at Richmond revealed one of the largest race-fixing scandals stock car racing has seen in recent memory. Having said that, I will admit that NASCAR’s decision to shorten all three rounds of qualifying to five minutes did seem to end the practice of “hurry up and wait” at the end of pit road. From the drop of the green flag in each round, a volume of cars hit the track immediately, and for the vast majority of the five minutes, there was action on track. Richmond being a short track had a lot to do with that (i.e. no drafting), but a shorter dose of a bad product is a step, however small, in the right direction. Eight of 37 cars in Saturday’s field went to the back for failing post-qualifying inspection, a number of which failed said inspection more than once. Of those cars, Hamlin still finished in the top five with a Joe Gibbs Racing Toyota, Suarez and Almirola had cars strong enough for top 10 finishes in Stewart-Haas Racing Fords that were only derailed by pit road speeding penalties, and both Jimmie Johnson and Chase Elliott finished top 15 in mediocre runs in Hendrick Motorsports Chevrolets. Meanwhile, despite all the intense technical inspections that continue (remember Harvick’s No. 4 team failed inspection three times last week at Bristol), the results on track remain the same…Gibbs and Penske have won every race, SHR was close but no cigar, and Chevrolet continues to lag behind. Instead of continuing to rely on the laser-point precision that inspection is now utilizing in the Cup garage, maybe it’s time to go to a “the car must fit in the box” form of inspection instead. They’re stock cars after all, big and blocky. Stock car racing has always relied on parity between the models to ensure that driver talent decides races on the track, but the current methodology is doing nothing but concentrating race wins in a narrow window. There has been no shortage of complaints relating to the amount of commercials that FOX is showing during its broadcasts of Cup races in 2019, and looking at the numbers, at least at Richmond, there’s actually some statistical trends starting to show that validate fans’ complaints. 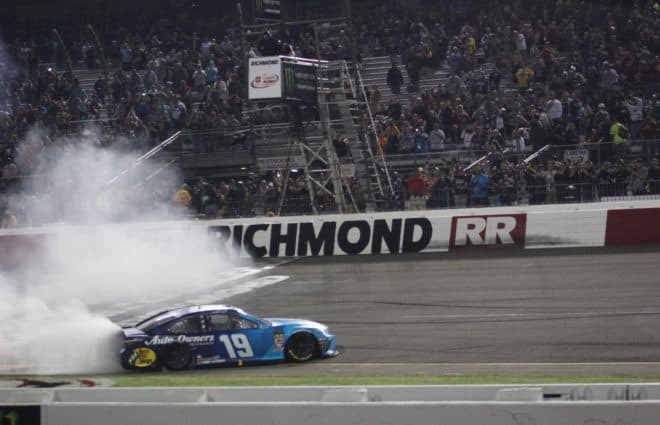 Let’s take a look at how long the stage breaks have been lasting at Richmond since stage racing kicked off in 2017: in the spring races, stage break cautions have lasted nine, 10, 10, 11, 10 and 10 laps from 2017 to 2019. In the fall races from 2017-2018, they’ve lasted eight laps each time. Either NASCAR officiating somehow gets more efficient over time (yeah right) or there really is a difference between FOX and NBC handling the “TV timeouts” NASCAR’s latest format affords them. 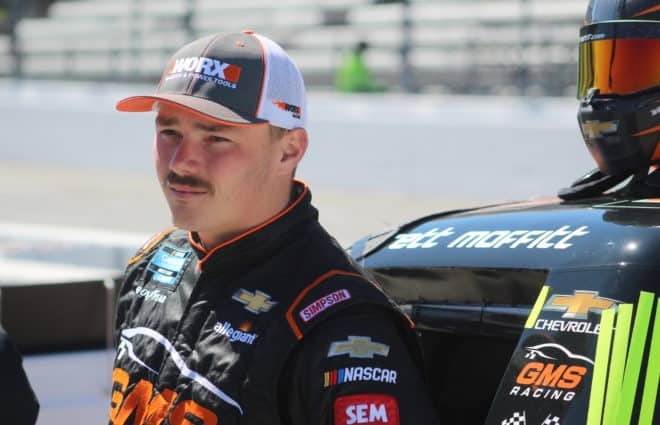 To give FOX some due credit, there were some solid examples of the booth providing insight over the course of 400 laps at Richmond on Saturday night. The booth did an excellent job discussing the brake ducts seen on the leaders’ cars and how Keselowski’s No. 2 visibly faded on the long run after running with glowing hot rotors as it battled with Truex for the race lead. Thanks to their analysis, Keselowski’s fade as Logano and Bowyer stormed forward was completely understandable. Also, the booth’s pit stop-by-pit stop breakdown of Johnson’s night on lap 279 was informative and thorough. Problem is, despite drivers like Almirola and Suarez, who actually made it farther up in the field than Johnson after starting in the rear for the same inspection failures, never got such a report. Same with Buescher as discussed earlier. It’s just like with DW’s retirement presser at Bristol last week. If FOX’s talent could take these moments of brilliance and make them last on the long run instead of a sprint race, there’d likely be a lot less griping and wishing for the return of NBC. Best Paint Scheme: Joey Gase For two reasons. One, as great as Sam Bass’ art is, it certainly looks better on a racecar itself. And second, because it got Gase and the No. 66 team on a Cup telecast. LC: "It is barely running. Just trickling fuel." CC: "Take it to the garage. We will plug the lap top in. Check the fuel filter and lines." After all, Johnson is by far the senior driver at Hendrick Motorsports now. 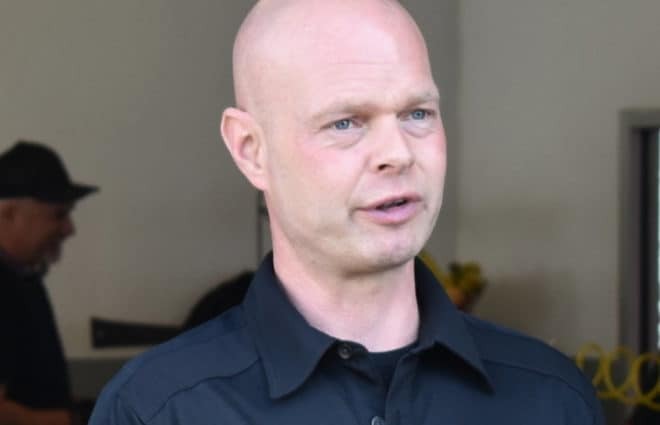 And since his senior mentor in Jeff Gordon left the organization, much of the organization’s prowess seems to have left with him. How It Rated: Last week at Bristol, fans got 479 laps of old school short-tracking that ended on a sour note with 21 laps of officiating ineptitude. This weekend, fans got 375 laps of largely uneventful short-tracking that ended on a positive note with 25 laps of the leader being challenged for the lead under green and managing a lead well enough to score the win. Pick your poison? What’s the Point(s)? Kyle Busch, Logano, Keselowski, Hamlin and Truex have all locked themselves into the playoffs with their early season race wins. If the postseason started today, Harvick, Kurt Busch, Bowyer, Blaney, Elliott, Almirola, Suarez, Johnson, Austin Dillon, Newman and Menard would point their way in. Erik Jones currently sits one point behind Menard for the cutoff spot. Dust Off the VCR: The Cup Series takes the upcoming Easter weekend off before heading South to the Talladega Superspeedway. Coverage from NASCAR’s longest oval will start at 2 p.m. ET. on FOX. I’d encourage all our readers to take advantage of the off weekend and hit a local short track. For those in the Shenandoah Valley, may I suggest the Battle of the Bay? Tags Clint Bowyer Joey Logano Kevin Harvick Martin Truex Jr.
That was a good recap of the race. As far as Johnson coverage goes my feeling is there should be no one in the booth that has a vested interest in a team. Gordon is listed as the owner of the 48 and it is important to get that team as much tv exposure as possible for the car’s sponsor. No one mentions this. DW did the same thing for Toyota when Mikey had his Toy team. On that subject any other sport in the world would have banned anyone who attempted to fix the outcome of an event. But not NASCAR. Mikey is a bug star.pisses me off. Reading many blogs the general consensus among fans is that they want DW to take that buffoon of a brother with him. Since tv ratings affect the price of ads I would imagine that Fox has to sell more ads at a lower price to get the same total money they received when the ratings were much higher. Just a thought. No matter how they attempt to manipulate things one thing stands out. It’s the same teams, with an occasional exception, that wind up in the top 16 in the end. And that is why it really doesn’t matter if HMS wins a race, or not, as long as they stay in the 16. Same with any team for that matter. Win and your in is just plain BS. My attitude you have to win to be in. And make it the top ten. Almost half the field making it is just plain stupid. That was incredible! A former champ winning! Some of his rivals making mistakes. Commentators letting the event speak for itself and saying as little as possible. Every seat filled and the crowd was roaring! Oops. Wrong venue. That was golf at Augusta. You forgot standing room only all around the venue. I didn’t see any of the race Saturday night but observed something interesting. I was out much of the night at a billiard hall/bar/restaurant and out of two dozen large-screen TVs, not a single one was showing the race. This was in the Charlotte area, by the way. The reason the broadcast crew can’t get around to mentioning guys like Buescher is because they’re too busy gushing about Johnson and all the rest of the Hendrick cars. Gordon & Waldrip in particular. Considering how little is happening over at Hendrick one has to wonder about all the attention? Is anyone else annoyed by the scoring board that is constantly on the left side of the screen? IT TAKES AWAY 30% of our view of racing. Maybe show it once every five minutes or so. FOX MUST DITCH THE CONSTANT SCORE BLOCK ON THE LEFT. I 100% disagree with you. It could be made thinner though. Saturday night’s race wasn’t great but it was very watchable. The leader could never get a huge lead although maybe that’s more a function of a short track than a great package. Watching Bowyer trying to get around Truex at Richmond I couldn’t help but wonder if Clint would spin out. It’s sad that Richmond was the last short track race until Aug 17th. That’s 5 months away and the bulk of the season and, arguably, the best weather months. That 2021 schedule really needs to include about 4 more short track races. IMO, 1 out of 3 races should be at tracks less than 1 mile (personally I’d prefer more but I am trying to be realistic). NASCAR should insist that there be a clause in the TV contracts that force the announcers to cover the entire field. Every car should get 30 seconds of coverage. 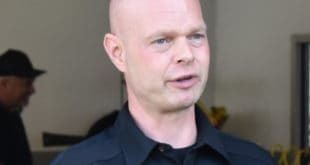 On any given week at least half the cars do get at least 30 seconds of coverage, so we are only taking about 20 cars which equates to 10 minutes. With the long stretches of boredom at most races, you wouldn’t think it would be too difficult to find those 10 minutes. Agree with Bill -race was decent. IMHO good racing doesn’t happen on tracks greater than 1 mile (Darlington is 1.3 miles and is the lone exception). All American 400 at the Nashville Fairgrounds was scrubbed bc of weather and is rescheduled for November. ARCA put on a good show in Salem, Indiana but it was rain shortened as well. ARCA will be at the Nashville Fairgrounds in early May. However, no defense just an observation, Team Penske is very big (documented) on team assistance till it is not needed…the hurdle is cleared, then every man for himself. Maybe they need to REDEFINE what those rules are, tweak them? Some communicato is getting distorted it seems. Who knows!! Both times it did seem to hinder a win, so who knows. And with regards to the MIKEY D. incident, that was just stupid on his part imo. He will never know if he could have won, or finished second. That is what teams do. Like it or not, Penske is not unique. Mikey went with first love TOYS, and it cost him.